There is tremendous need in our region for quality child care. Free resources, training, and support is available to help you start your own child care business. The resources below are a good place to start, and you can also contact Small Business Development VISTA, Rae Larson at (360) 734-8396 ext 430 or send an email. The Imagine Institute has a mentorship program for individuals interested in becoming a family home provider. Those who complete the program receive a financial incentive to invest in their new business. The Department of Children, Youth, and Family Services (DCYF) includes information on the licensing process, rules, and regulations. DCYF Licensing Orientation information: Those interested in becoming family home child care providers must view an hour-long online presentation about family home child care licensing in Washington state. Tom Copeland’s blog on family home child care is a great resource for individuals who are in the process of starting a child care. The website includes useful handouts and checklists for getting started. 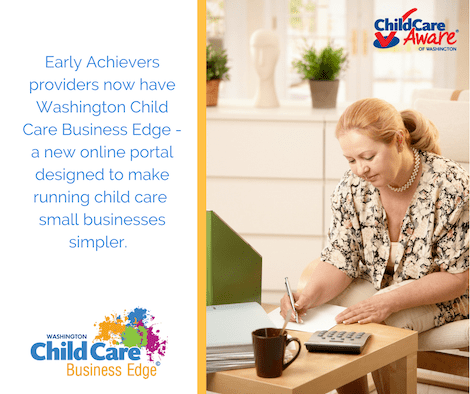 A guide on how to start a quality child care business from the US Small Business Administration. Whatcom County small business resources compiled by the Bellingham Public Library.